WYSE International is a charity that works with emerging leaders from all over the planet who are inspired to make the world a better place. WYSE provide leadership education and ongoing coaching support that is delivered by highly experienced professionals on a pro bono basis. Over 30 years WYSE has worked with thousands of emerging leaders from over 115 countries, supporting them to take their visions into action. WYSE International is committed to increasing access to values-based, global leadership education to as many young people as possible. 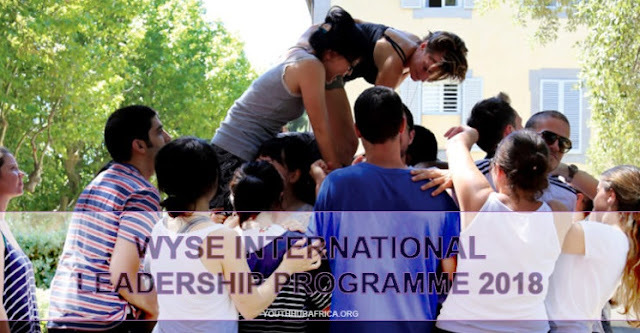 Thanks to the generosity of a wide range of people including donors, alumni volunteers and pro bono expertise, WYSE is able to offer all participants to the International Leadership Programme a fully funded tuition bursary, worth £6,500. This covers the costs of teaching on the ILP and the longer-term coaching support offered to participants and does not include the accommodation and food costs associated with residential programmes. Typical costs of the ILP that participants are asked to cover are approximately £990 GBP, with slight regional variation. - All participants receive tuition bursaries of £6500 to cover the cost of teach and the long term coach programme. To apply and for more information visit the official page www.wyse-ngo.org.